The role of midwives in history began to fascinate Laurie Alice Eakes in graduate school, and she knew that someday she wanted to write novels with midwife heroines. Ten years later, after several published novels and a National Readers Choice Award for Best Regency, the midwives idea returned, and Lady in the Mist was born. 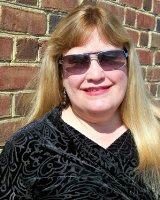 Now Laurie Alice writes full time from her home in Texas, where she lives with her husband and sundry dogs and cats. By virtue of her profession as a midwife, Tabitha Eckles is the keeper of many secrets. Dominick Cherrrett is a man with his own secret to keep: namely, why he, a British aristocrat, is on American soil working as an indentured servant. In a time when relations between America and England rest of the edge of a knife, Tabitha and Dominick cross paths, leading them on a journey of intrigue, threats, public disgrace, and...love. But can Tabitha trust Dominick? Finding true love seems impossible in a world set against them. With stirring writing that draws you directly into the story. Lady in the Mist takes you on the thrilling ride of love's discovery. Laurie Alice Eakes is a great storyteller. She places trouble after trouble in Tabitha's path to be allowed to follow the occupation of her mother and grandmother. She has heard secrets from mothers-to-be in the pain of delivering a child. Tabitha has never revealed those secrets. She could use some of these secrets to shame men sitting on the town council that reviews her case for continuing to be a midwife. Will she do that or risk being run out of town?. Then there's Dominick and a former beau that has re-entered her life that she must consider for her future. 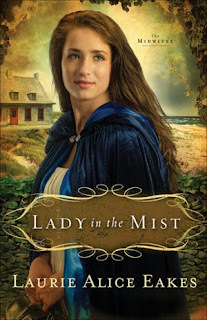 Remember: leave a comment on THIS post by 6 p.m. CT Sunday, June 17, 2012 and you'll be entered in the drawing for a copy of Lady in the Mist. You must be eighteen, have a U.S. mailing address, void where prohibited. Please, please remember to leave your email address so that should you be the winner I can get in touch with you for your mailing address. I've read quite a few good reviews of Lady in the Mist. I love to read romantic suspense so this sounds like a great book for me. Thanks for giving away a copy. Pam, you're welcome. Thanks for reading the blog and commenting. Look for more book giveaways in the future. This sound like my kind of book. So glad you had Laurie on you blog! I read Heart's Safe Passage, the 2nd book in this series, earlier this year. Would love to read this book. Thanks for the giveaway! Pat and Brooke,thanks for stopping by. I enjoyed reading this book and the mystery continues all the way through. Got you both entered. Thanks for commenting. I love historicals --and the story sounds unique! Thanks for the opportunity to win! Lady DragonKeeper and eyeballlucy, So glad you both left a comment. A lot of us like historicals and this one has history and mystery. Thanks for commenting. I would love to read this book! What an intriguing theme. The period when England and the colonies were in chaos is one of my favorite time periods because it lends itself to suspense in the lives and loves of the characters. Ann and Kathleen, I'm glad you both will like reading about this time in history. And there's plenty of mystery. Thanks for stopping by and commenting. Sounds like a great read! Would love it! silygoos at gmail dot com. Susan and Liz, It is a great read. I'm glad I can have this giveaway. Thanks for reading my blog and commenting. You're both entered. So this book is a must-read for me whether I win it or not! It's going on my To-read list NOW! So glad you revisited this idea. Becky, what a story you've connected to Lady in the Mist. Thanks for commenting. Thank you for the great review and giveaway!I would love to read this book! Sounds like a great book. I've never read any of Laurie Alice's books, so would love to win this one. Rachelle, Samantha, and Patti, this book is a good one. Thanks to all of you for reading my blog and leaving a comment. Lady in the Mist sounds like a wonderful book. I would love to win this book. Thanks for having the giveaway. You are welcome. Thanks for coming by, reading my blog and leaving a comment. I almost bought this book today, but had to make a choice between this one and another. So want to read this though - thank you for the opportunty to win. Kathy, So glad you're interested in reading this book. I think you'll enjoy it. Thanks for leaving a comment. Thank you, Ladies, for your interest in Lady in the Mist. Becky, I love your dream story. The image of a woman walking on a misty beach came to me in the middle of the night, a sort of waking dream. For those who are interested in reading it and don't win a copy, Amazon has it for $6.00 right now. Diane, the cover is a beautiful one and the book's a good read. Thanks for commenting. Thanks for reading my blog and for leaving a comment to be entered to win a copy of Lady in the Mist. Jenna, Lady in the Mist is full of history and mystery and of course romance. Thanks for stopping by and leaving a comment. Thank you all for stopping by and, Jo, for reviewing my book. I left a comment the other day, and it seems to appear as "Unknown" Not sure how that happened, but Blogger and I have a love/hate relationship.